BOSTON, April 7, 2010 – In an international effort to ensure that Americans in need have access to healthier whole grain options, generous and health-focused members of the Whole Grains Council banded together to donate over one million servings of whole grain food to schools, food pantries, homeless shelters, and other charities across the country. This food drive, called the Whole Grains Giveaway, represents the collected charitable efforts of various food companies who made donations of whole grain products in January, February, and March of this year. When totaled, these civic-minded companies made 37.5 tons of whole grain options available to people who might not otherwise be able to afford the rising cost of healthier food.”Whole grains are important to everyone, in every economic group,” said Kara Berrini, Program Manager for the Whole Grains Council, “which is why we timed the Giveaway to coincide with National Nutrition Month in March. If you’re looking to understand just how impressive this effort is, 37.4 tons of whole grain food would fill one-and-a-half semi tractor trailers. That’s big!” Berrini praised the companies for giving away enough whole grain food to provide the recommended minimum three servings of whole grains a day for 100 people for more than ten full years.Those contributing to the Whole Grains Giveaway included: Back To Nature; Dave’s Killer Bread / NatureBake; Frontier Soups; Golden Temple of Oregon; King Arthur Flour; Mestemacher Bread / Carl Brandt; Oldways; Vaasan & Vaasan Oy; and Whole Foods. 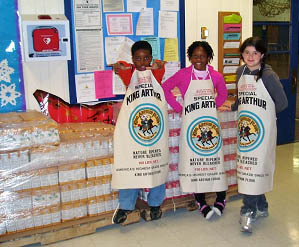 Information about each company’s donations can be found on the WGC website at http://wholegrainscouncil.org/newsroom/whole-grains-giveaway. Repeated success for Mestemacher, who submitted their products to the DLG for quality control testing. Once more the DLG acknowledged the outstanding quality of Mestemacher products awarding them ‘Gold’ in the category ‘Award for the Best’ - (Preis der Besten”). Then In 2013 came the first federal honour, Ilse Aigner, the German Minister for Food, Agriculture and Consumer Protection, presented Mestemacher, with the ’Bundesehrenpreis’. Mestemacher’s social enterprise plus innovative capacity justified the award "Top 100" Best medium-sized German companies awarded through the business magazine ‘Die Wirtschaftswoche‘.